Trumbull High Model Congress | Kind.Fund: Crowdfunding and fundraising for personal causes and charities. Kidambi & Associates supports the Trumbull High Model Congress Team! Continued success to the Trumbull High Model Congress Team! The Trumbull High Model Congress team wants to travel to Washington DC in November to participate in Princeton's Model Congress competition as well as New Haven in December to participate in Yale's Model Congress competition. Model Congress offers high school students the opportunity to simulate the experience of serving in Congress, sitting on the bench as a Supreme Court Justice, or counseling our Commander in Chief as a member of the Presidential Cabinet. The conferences draw approximately 1,200 participants from all across the political spectrum and from all over the country. 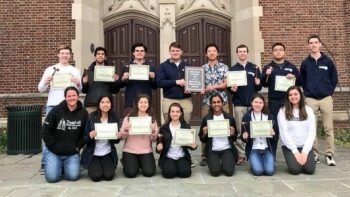 Last year, Trumbull High School won 14 Best Delegate Awards and 15 Honorable Mention Awards. We also had our first Best Delegate in Full Session Award and we capped off the year with winning the Best Delegation Award at the University of Pennsylvania (top team at the conference). Trumbull High School is looking to send twenty students and two adults to these conferences. In order to attend, we will need to raise the necessary funds for the travel. This money will go towards our hotel costs for the four days as well as the registration costs for the conference. The parents of the students will cover all the transportation costs and the leftover money not raised. Model Congress allows students to foster civic engagement and learn valuable lessons outside of the classroom. They are able to develop their public speaking and learn to write legislation, defend their ideas, and compromise to get legislation passed. Your donation, no matter how small, will help my students have an experience that they won't forget!